Could You Manage With Half? Minimalist gurus always seem to be telling us what we could live without, but I don’t like to deprive myself of anything. 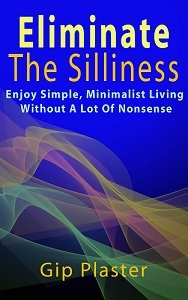 I’m a smarter breed of minimalist, and I like to live well. But I don’t like to be wasteful or careless either. Today’s post is based on a simple, deliberate question: Could you manage with half? I’ll use the next few hundred words to explore (complicate) this question, then I hope you’ll answer it in the comments section below. Part of living your best life is avoiding waste and excess. A life filled with excess is a life with little room for truly meaningful things. Think seriously about the question. Could you save money by managing with half? Could you avoid time-consuming trips to shops and grocery stores if you managed with half? Would you have more time for what really matters if your work took up half as much time? From breath mints to time-clock-punching, you might have a better life if you managed with only half. Toothpaste commercials show people piling on a full strip of toothpaste, but no sensible person does that. About a pea-sized dab is all you really need, but few use that little. Could you get by using half as much toothpaste? Consider the chicken breast, salad or vegan bean patty on your dinner plate. Is it larger than one serving? And do you feel overfull after eating it? Would half as much satisfy you, save you money, improve your overall health and make you feel better about yourself? Or could you at least manage with half as much of the most expensive or most unhealthy item on your plate? Could you manage with half as many clothes, half as many colognes or half as much space? Maybe you don’t want half as many family members or half as much love, but wouldn’t half as many bills or half as many choices of cereals in your pantry be nice? Living a simple, deliberate life means analyzing your choices and adjusting your life so that you’re not using more than you need, more than is prudent or more than your budget can tolerate. It means reducing your environmental impact and expanded your horizons with new, carefully designed experiences. Could you manage with half as much in your life today? I’m also announcing today that I’ll be posting only once a week for the rest of this year. That will allow me more time to work on other writing projects. It will also allow each post to make more of an impact. I’ve noticed that many posts continue to get comments for several days if I don’t rush the process by putting up something new. It’s funny because I didn’t immediately see how well the announcement of half as many posts fits in with today’s post. While my life may be simple, I’m not always as deliberate as I would like. I’m currently working on deleting half my recipe collection. I think cleaning products are next. A bottle of Lemon Joy replaces about 80 percent of cleaning products. A disinfectant spray cleaner like Lysol takes care of most of the rest. Thanks for commenting, Linda. I’m glad to hear you’re ridding yourself of recipes. I’ve found that a frequently-rinsed microfiber cloth and plain water will clean an amazing variety of surfaces, including windows and floors. Just be sure not to launder your microfiber with any type of fabric softener to maintain the static cling and absorbency of the fabric. I wash mine and then hang to dry. I’ve never tried a microfiber cloth. Of course, I rarely wash the windows or the floor. I wonder how it would manage with cat hair?? “Half” is do-able in many circumstances, but I think it’s important to realize that “half” is just an arbitrary number. In most circumstances the answer is probably “no, but I could do with ______”. Usually when I find things I can cut it’s not as extreme as 50%….but 10%, repeated a few times, is definitely progress! Yes, even a 1 or 2 percent decrease makes a difference. I’d accept a 2 percent decrease on my electric bill if that’s all I can get. Right, Robert. Sometimes half is the right amount. Just as often, it is more or less than right. On the other hand, it makes a good starting point that’s easy for most people to visualize. Interesting post – I’ve just been thinking about this myself and have begun to pare down in several areas. I’m not sure that half is possible in every area but I could easily get by with varying amounts of less in all areas. I’m looking forward to the time when I no longer have any excess stuff. Excess keeps creeping back into my life, but I swash it whenever I can. Good to have you here, Crystal. Morning Mindreader! 🙂 My post today is planned as ‘How to halve your weekly grocery spend’…………. Great post, Jo. Thanks for mentioning it here. Good to have you around this week. I’m about to find out if I can live on half my salary. My hours are going to be cut (not my idea). At first I was freaked out, but now I’m looking at it as a challenge and focusing on all the extra time I’ll have. And I continue to clear stuff out of the house — My clothes and my book collection are down by a third if not half. It’s really kind of addictive once you get started, space opening up all around you. I’m enjoying it. Half as many hours means much more time to live your life. You may find you have the time now to start a more lucrative money-making project of your own. Good to meet you, Jan. I hope you can comment every week. I look forward to getting to know you. Reduction is good. While “half” isn’t always the right amount, it’s a reasonable starting point for discussion. I think there’s a lot of room for reduction via multipurposing. Somene suggested cleaning products. Another place that works is tableware. Do I really need several different sizes and shapes of cups and glasses? plates and bowls? Often it comes down to how much we are willing to compromise, but not always. As for the half-as-many posts, I’ve noticed a few blogs I regularly read have been slowing down in frequency. I went two weeks without a post this time, but I think that’s too long. I’ve just been busy with other things and distractions. I think your plan of once a week is good – far better than forcing yourself to publish lower quality work more frequently. Yes, I think it’s interesting that some people would never eat a small piece of cake on a big plate. I’m about to further reduce the number of plates and bowls we have, which I hope will further reduce the washing we do. I’m writing more for money trying to stabilize my situation, but I’m already missing writing two blog posts a week. I can always change my mind. But it’s one post a week for the next few weeks anyway. Nice and insightful post. I’ve recently started the proces of decluttering my own life. If I ask myself the question whether or not I could live with half, for now the answer is a definite no. Like some of the other commentors already pointed out, just cutting out half would be harsh but going in steps is easier. That’s the path I’m currently taking, 15-30 minutes a day. As you get further into the process, you may find that reducing by half isn’t enough. A few minutes and few percentage today become addictive after a while, and you’ll soon be desperate to reduce more things from your life. Thanks for participating in the conversation, Robin.